VAL HEART (“VHEART”) IS WILLING TO GRANT YOU RIGHTS TO ESTABLISH AN ACCOUNT AND TO USE THE SERVICES PROVIDED BY THIS SITE ONLY UPON THE CONDITION THAT YOU ACCEPT ALL OF THE TERMS CONTAINED IN THIS AGREEMENT. PLEASE READ THE TERMS CAREFULLY. BY CLICKING ON “I ACCEPT”, YOU WILL INDICATE YOUR AGREEMENT WITH THEM. IF YOU ARE ENTERING INTO THIS AGREEMENT ON BEHALF OF A COMPANY OR OTHER LEGAL ENTITY OR PERSON, YOUR ACCEPTANCE REPRESENTS THAT YOU HAVE THE AUTHORITY TO BIND SUCH ENTITY OR PERSON TO THESE TERMS. IF YOU DO NOT AGREE WITH THESE TERMS, OR IF YOU DO NOT HAVE THE AUTHORITY TO BIND YOUR ENTITY OR PERSON, THEN VHEART IS UNWILLING TO GRANT YOU RIGHTS TO ESTABLISH AN ACCOUNT AND TO USE THE SERVICES PROVIDED BY THIS SITE. 1. Parties. The parties to this legal Agreement are you, and the owner of this valheart.com website business, vheart. If you are not acting on behalf of yourself as an individual, then “you”, “your”, and “yourself” means your company or organization or the person you are representing. All references to “we”, “us”, “our”, “this website” or “this site” shall be construed to mean this valheart.com website business and vheart. 5. Membership Services. Membership services include Access to the AnimalTalk Coaching Club Forum and Bonus Offerings (“Services”). We reserve the right to update and modify the Services from time to time. 8. Membership Term. The term of your membership shall be specified during the registration process. After the expiration of this term, you may purchase another membership in accordance with the terms and conditions posted at this site. 11. Membership Fees; Periodic Payment; ROSCA Disclosures. 11.2 In accordance with the Restore Online Shoppers Confidence Act (ROSCA), you hereby authorize vheart to charge the credit card used in the registration process, as follows: charges will be monthly, for the dollar amount, and for the billing periods that are specified in the registration process. If the credit card authorization fails, we will request updated credit card information. However, if you do not provide updated credit card information that successfully authorizes within 72 hours after notice, we may terminate your account and rights to all Services from this site. 12. License Grant For Content. 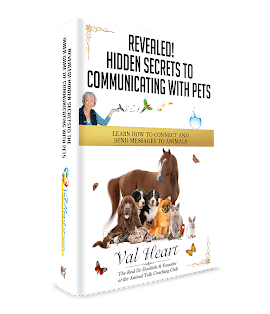 Subject to the terms of this Agreement, you are granted non-exclusive rights to download and use the content available for download from this website (“Content”) only for purposes of use for your own animal communication skill development. 13. Use Restrictions For Content. You may copy the Content for archival purposes, provided that any copy must contain the original Content’s proprietary notices in unaltered form. You may not: (i) permit others to use the Content; (ii) modify or translate the Content; (iii) merge the Content with another product; (iv) remove or obscure any proprietary rights notices or labels on the Content; or (v) resell, sublicense, or use the Content for any commercial use or purpose. 14. Money-Back Guarantee For Services. We offer a thirty (30) day money-back guarantee. If You are not satisfied with the this site’s services, you will receive a complete refund if you notify us within thirty (30) days of your registration requesting a refund under this guarantee. 15. Technical Support. We shall answer questions by email and telephone during our normal business hours regarding the use of the Services. 16. Warranty Disclaimers. EXCEPT AS MAY BE PROVIDED IN ANY SEPARATE WRITTEN AGREEMENTS SIGNED BY THE PARTIES, THE SERVICES, CONTENT, AND/OR PRODUCTS ON THIS SITE ARE PROVIDED “AS-IS”, AND NEITHER WE NOR ANY OF OUR LICENSORS MAKE ANY REPRESENTATION OR WARRANTY WITH RESPECT TO SUCH PRODUCTS, SERVICES, AND/OR CONTENT. EXCEPT AS MAY BE PROVIDED IN ANY SEPARATE WRITTEN AGREEMENT SIGNED BY THE PARTIES OR SEPARATE AGREEMENT ORIGINATING FROM THIS SITE, THIS SITE AND ITS LICENSORS SPECIFICALLY DISCLAIM, TO THE FULLEST EXTENT PERMITTED BY LAW, ANY AND ALL WARRANTIES, EXPRESS OR IMPLIED, RELATING TO THIS SITE OR PRODUCTS, SERVICES AND/OR CONTENT ACQUIRED FROM THIS SITE, INCLUDING BUT NOT LIMITED TO, IMPLIED WARRANTIES OF MERCHANTABILITY, COMPLETENESS, TIMELINESS, CORRECTNESS, NON-INFRINGEMENT, OR FITNESS FOR ANY PARTICULAR PURPOSE. THIS SITE AND ITS LICENSORS DO NOT REPRESENT OR WARRANT THAT THIS SITE, ITS PRODUCTS, SERVICES, AND/OR CONTENT: (A) WILL BE SECURE, TIMELY, UNINTERRUPTED OR ERROR-FREE OR OPERATE IN COMBINATION WITH ANY OTHER HARDWARE, SOFTWARE, SYSTEM OR DATA, (B) WILL MEET YOUR REQUIREMENTS OR EXPECTATIONS, OR (C) WILL BE FREE OF VIRUSES OR OTHER HARMFUL COMPONENTS. Disclaimer: The entire contents of this website are based upon the opinions of Val Heart, unless otherwise noted. Individual guest articles are based upon the opinions of the respective author, who retains copyright as marked. This information is not intended to replace a one-on-one relationship with a qualified pet health care professional and is not intended as medical advice. It is intended as a sharing of knowledge and information from the research and experience of Val Heart and her community. Val encourages you to make your own pet health care decisions based upon your research and in partnership with a qualified pet health care professional.. WE DO NOT WARRANT THAT THE SERVICES WILL BE UNINTERRUPTED, ERROR-FREE, OR 100% SECURE. THESE DISCLAIMERS CONSTITUTE AN ESSENTIAL PART OF THIS AGREEMENT. NO PURCHASE OR USE OF THE ITEMS OFFERED BY THIS SITE IS AUTHORIZED HEREUNDER EXCEPT UNDER THESE DISCLAIMERS. IF IMPLIED WARRANTIES MAY NOT BE DISCLAIMED UNDER APPLICABLE LAW, THEN ANY IMPLIED WARRANTIES ARE LIMITED IN DURATION TO THE PERIOD REQUIRED BY APPLICABLE LAW. SOME STATES OR JURISDICTIONS DO NOT ALLOW LIMITATIONS ON HOW LONG AN IMPLIED WARRANTY MAY LAST, SO THE ABOVE LIMITATIONS MAY NOT APPLY TO YOU. 17. Limitation of Liability. IN NO EVENT SHALL EITHER PARTY’S AGGREGATE LIABILITY EXCEED THE AMOUNTS ACTUALLY PAID BY AND/OR DUE FROM YOU IN THE SIX (6) MONTH PERIOD IMMEDIATELY PRECEDING THE EVENT GIVING RISE TO SUCH CLAIM. IN NO EVENT SHALL EITHER PARTY AND/OR ITS LICENSORS BE LIABLE TO ANYONE FOR ANY INDIRECT, PUNITIVE, SPECIAL, EXEMPLARY, INCIDENTAL, CONSEQUENTIAL OR OTHER DAMAGES OF ANY TYPE OR KIND (INCLUDING LOSS OF DATA AND/OR UNAUTHORIZED ACCESS OR ACQUISITION OF DATA, REVENUE, PROFITS, USE OR OTHER ECONOMIC ADVANTAGE) ARISING OUT OF, OR IN ANY WAY CONNECTED WITH THE SERVICES, INCLUDING WITHOUT LIMITATION THE USE OR INABILITY TO USE THE SERVICES, OR FOR ANY CONTENT OBTAINED FROM OR THROUGH THE SERVICES OR THIS SITE, ANY INTERRUPTION, INACCURACY, ERROR OR OMISSION, REGARDLESS OF CAUSE, EVEN IF THE PARTY FROM WHICH DAMAGES ARE BEING SOUGHT OR SUCH PARTY’S LICENSORS HAVE BEEN PREVIOUSLY ADVISED OF THE POSSIBILITY OF SUCH DAMAGES. 18. Confidential Information. You agree that all non-public information that we provide regarding the Services, including without limitation, our pricing, marketing methodology, and business processes, is our proprietary confidential information. You agree to use this confidential information only for purposes of exercising your rights as our affiliate while in strict compliance with this Agreement, and you further agree not to use or disclose this confidential information for a period of three (3) years after termination of this Agreement. 22. How We Treat Postings To This Site. We will not treat information that you post to areas of this site that are viewable by others (for example, to a blog, forum or chat-room) as proprietary, private, or confidential. We have no obligation to monitor posts to this site or to exercise any editorial control over such posts; however, we reserve the right to review such posts and to remove any material that, in our judgment, is not appropriate. Posting, transmitting, promoting, using, distributing or storing content that could subject us to any legal liability, whether in tort or otherwise, or that is in violation of any applicable law or regulation, or otherwise contrary to commonly accepted community standards, is prohibited, including without limitation information and material protected by copyright, trademark, trade secret, nondisclosure or confidentiality agreements, or other intellectual property rights, and material that is obscene, defamatory, constitutes a threat, or violates export control laws. 26. Notices. We may give notice to you by means of (i) a general notice in your account information, (ii) by electronic mail to your e-mail address on record in your Registration Data, or (iii) by written communication sent by first class mail or pre-paid post to your address on record in your Registration Data. Such notice shall be deemed to have been given upon the expiration of forty eight (48) hours after mailing or posting (if sent by first class mail or pre-paid post) or twelve (12) hours after sending (if sent by email). You may give notice to us (such notice shall be deemed given when received by us) at any time by letter delivered by nationally recognized overnight delivery service or first class postage prepaid mail to us as follows: Val Heart, 1738 Donerail St, , San Antonio, TX 78248, in either case, addressed to the attention of “President of the Company”. Notices will not be effective unless sent in accordance with the above requirements. 27. Arbitration. Except for actions to protect intellectual property rights and to enforce an arbitrator?s decision hereunder, all disputes, controversies, or claims arising out of or relating to this Agreement or a breach thereof shall be submitted to and finally resolved by arbitration under the rules of the American Arbitration Association (“AAA”) then in effect. There shall be one arbitrator, and such arbitrator shall be chosen by mutual agreement of the parties in accordance with AAA rules. The arbitration shall take place in San Antonio, Texas, USA, and may be conducted by telephone or online. The arbitrator shall apply the laws of State of Texas, USA to all issues in dispute. The controversy or claim shall be arbitrated on an individual basis, and shall not be consolidated in any arbitration with any claim or controversy of any other party. The findings of the arbitrator shall be final and binding on the parties, and may be entered in any court of competent jurisdiction for enforcement. Enforcements of any award or judgment shall be governed by the United Nations Convention on the Recognition and Enforcement of Foreign Arbitral Awards. Should either party file an action contrary to this provision, the other party may recover attorney’s fees and costs up to $1000.00. 28. Jurisdiction and Venue; Applicable Law. The courts of Bexar County in the State of Texas, USA and the nearest U.S. District Court in the State of Texas shall be the exclusive jurisdiction and venue for all legal proceedings that are not arbitrated under this Agreement. The laws of State of Texas, USA shall apply to all issues in dispute, excluding its rules regarding conflicts of law. 32. U.S. Government End-Users. We provide the Web Services, including related software and technology, for ultimate federal government end use solely in accordance with the following: Government technical data and software rights related to the Web Services include only those rights customarily provided to the public as defined in this Agreement. This customary commercial license is provided in accordance with FAR 12.211 (Technical Data) and FAR 12.212 (Software) and, for Department of Defense transactions, DFAR 252.227-7015 (Technical Data ? Commercial Items) and DFAR 227.7202-3 (Rights in Commercial Computer Software or Computer Software Documentation). If a government agency has a need for rights not conveyed under these terms, it must negotiate with us to determine if there are acceptable terms for transferring such rights, and a mutually acceptable written addendum specifically conveying such rights must be included in any applicable contract or agreement. Unpublished-rights reserved under the copyright laws of the United States.